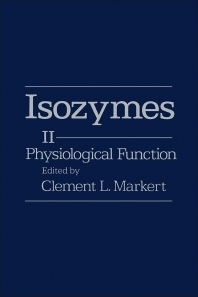 Isozymes, II: Physiological Function contains manuscripts presented at the Third International Conference on isozymes convened in April 1974 at Yale University. Separating 53 manuscripts into chapters, this book first discusses the medical uses of isozymes. It then describes the various dehydrogenase isozymes mechanisms of action and biological functions. Other general topics explored are the roles of isozymes in adaptation to varying temperatures and their use in the study of mitochondria. Significant topics on specific isozymes are given separately in other chapters.